"A Tarantino-like spin on a Scandinavian drama that include the hard-hitting elements of an ageing action star"
Scandinavian cinema is an acquired taste for many around the world. The lighting and the tone are filtered through the minds of writers and directors whose lives are surrounded and influenced by the snow-covered landscape. From The Seventh Seal to The Girl With the Dragon Tattoo, some of these films have proven to have moderate cross over success and have been the inspiration for bigger budget Hollywood productions. In Order of Disappearance was the Norwegian gem that director Hans Petter Moland has been given the opportunity to remake with Colorado as the backdrop and Liam Neeson in the lead role. The challenge will be if he can recapture the look and feel of his original creation with Cold Pursuit. Neeson plays Nels Coxman, a snowplough operator in the ski resort known as Keyhoe, where people are known for coming to ski, party and get high. He has proven to be a centrepiece of the community and receives the key to the city for his work at keeping this corner of civilisation open to the world. Then his quiet life with his wife (Laura Dern) is disrupted when his son is found dead of an apparent heroin overdose, despite there being any evidence that Kyle (Micheál Richardson) had any history of drug use. As the Coxman's grieve the loss of their son, Nels begins to discover evidence that his son was mistakenly caught up in a drug ring headed up by Viking (Tom Bateman). The unassuming civil servant begins to work through the layers of the organisation and enacts his own form of justice on the various dealers. While he works his way up the chain to the head of the criminal network by causing each member to disappear, the ploughman inadvertently begins a turf war between the competing drug lords of Colorado. Eventually, this war spills out on the streets of the small tourist community and gets the attention of local law enforcement (Emmy Rossum) who finds a sense of purpose and motivation in determining the cause of this excessive bloodshed. To call this movie a dark comedy would mean weighing in heavy on the dark and bloody aspects of the film with only the briefest moments of comedy. But Moland comes close to recreating a frame-by-frame version of his original film. By replacing the snow plains of Norway for Colorado, Stellan Skarsgård with Liam Neeson, and the Serbs with American Indians, the Norwegian director does manage to transition the look and feel of the original. Both films contained a Taken and Tarantino-esque quality that will appeal to those who prefer a healthy amount of blood and violence to complement a set of off-beat performances. 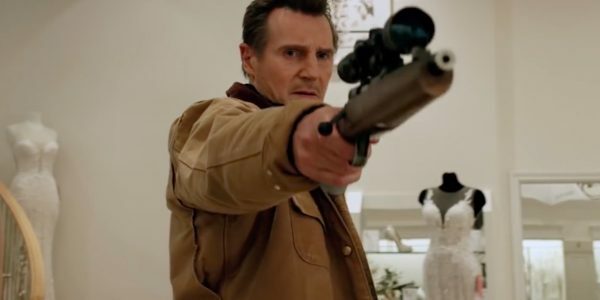 Then to capitalise on Neeson’s penchant for effective revenge thrillers, even though he is a more vulnerable and understated character, makes this a successful transition to the hyper-violent revenge crowd. There is a bit of humour added in to allow for a pressure release on the violent tensions, primarily in the name cards of each person killed throughout the film. These minuscule moments of satire hardly move this into a comedy, but they do allow for the audience to catch their breath by being allowed to laugh during the action. Cold Pursuit contains a body count and enough violence that could label it as a war film, but the underlying revenge plot makes this a fascinating character piece. Hans Petter Moland seems to be self-aware enough to know that this film will have limited appeal, but he does stay true to his initial creation. A perfect movie who wants to combine Scandinavian drama with Tarantino-like elements and the hard-hitting element of the ageing, but effective action star. It may be a small target audience, but for those who sit in this demographic, this will satisfy your cravings for blood and violence with a dash of humour.